The word chakra comes from the Sanskrit language and literally translates to ‘wheel’. Often described as ‘wheels of light’ a chakra is an energy center in the human body aligned with the spine and considered to be an interface between the physical, emotional, mental, and spiritual aspects of an individual. Though there are many systems detailing the subtle anatomy of humans, some speaking of 12 or even 100s of chakras, the most common tradition is that of seven chakras. 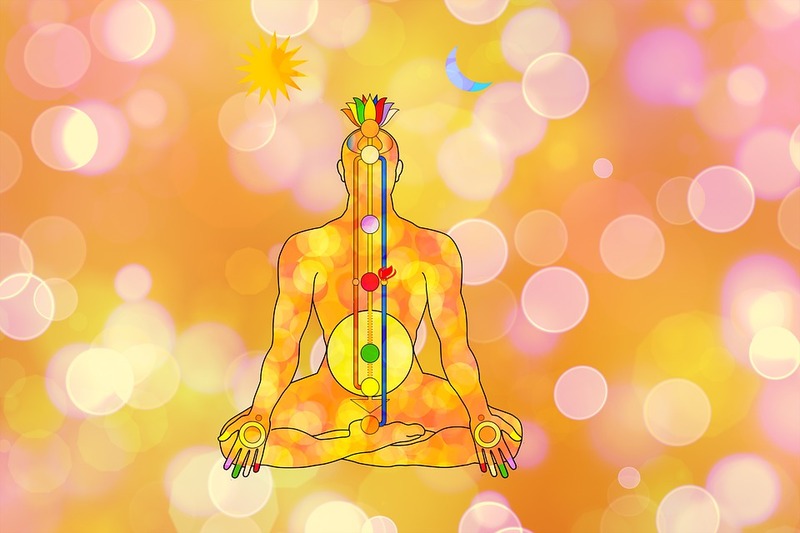 Starting at the base of the spine, the coccyx, and moving up to the crown of the head, these seven energy centers represent and offer a way of working with the unconscious and subconscious realms of the self to heal past injuries and issues and encourage balance, wholeness, and vibrancy in the present. Working with the chakras is an engaging adventure. There are many entries to the path and often people find that some aspect of chakra awareness is already present in their yoga practice or spiritual life. I myself began exploring the chakras through their colour vibrations, which made a lot of sense as a makeup artist who was surrounded by a rainbow most hours of the day, and got to see first hand people’s reactions and relationships with colour. Over time my growing interest and pursuit of aromatherapy training turned my attention to the fragranced side of chakras, while my deepening dedication to teaching yoga opened my understanding to the energetic potential of asana through essential form as well as sequencing. The fact that it was fun at all stages kept me engaged with energy anatomy and created a supportive format for self-care through troubled times. This is a blessing of a multidimensional approach: where ever we are there is a lifeline to connect us to the practice. No matter which gate we use to access the chakra system, being present in our physical and emotional realities helps to alleviate strain and stress that might otherwise build up in the subtle body. In short, working with the chakras can create more freedom and spontaneity overall. One practice in particular that’s been a constant delight is the simple chanting of the bija mantras of the chakras. Now, I’ve never been a singer per se, but during my busy days of commuting from one end of Seattle to another to teach I would often find myself in the midst of the chakra bijas, slowing my breath and lightening my mood, unsure when I’d even begun to sing aloud! Bija means ‘seed’ and a bija mantra is thought to contain the most essential energy vibration of a thing, be it a chakra or deity. Chanting these sounds brings us into resonance with the qualities and strengths of the center. Each of the first six chakras have a short, emphatic sound while the seventh, at the crown of the head, is thought to be the dwelling place of either silence or an extended, lengthened OM. In a short period of time, whether in the car for a long drive, playing in the kitchen with a new recipe, or seated on the mat before or after practice, running through the sounds creates a sense of balanced well-being. And, unlike some mantras that are not advised for silent, inner practice, these can be mentally repeated – so if you feel the need for them while in line at the grocery store you can practice without drawing funny looks! Chanting an individual bija mantra is wonderful when done while practicing postures relating to the same chakra: for instance the solar plexus chakra’s RAM can increase the vitality and integrity of Setu Bandhasana/Bridge Pose. OM has long been used to assist meditators move from everyday mind to mindfulness. And the HAM of the fifth chakra, visshudi or ‘purification’, is much more comfortable and pleasant sounding than the regular coughing often done to clear the throat but just as effective, after all, these sacred syllables are revered for their ability to work on all levels of being. To integrate the mantras with asana, try taking a pose and then repeating the seed sound as many times in one breath as you can, keeping a steady, comfortable pace and letting your voice bolster your body. The English name of each chakra locates the area it is found, just choose postures that work that part of the body. In general any posture targeting the legs is a ‘root’ pose, and relaxation and meditation poses are appropriate for both the sixth and seventh chakras. Most importantly: play with an open heart and curious mind – have fun! Join us to explore the application of chanting in asana (yoga postures), pranayama (conscious breathing) and meditation practices, and through lectures, workshops and personal experiences. Once upon a time Jessica was a full time yoga teacher. More recently she managed a knitting shop. Currently he's traded in retail for six months world travel with her partner. Her iPod is loaded with equal parts music and yoga lectures and is stored in her travel bag next to her travel knitting.